"If I'm elected president, I'm accepting no salary." on Monday, January 16th, 2017 at 10:26 a.m.
By Kyra Haas on Tuesday, December 4th, 2018 at 4:35 p.m.
President Donald Trump donated his second-quarter salary for 2018 to the Small Business Administration, reaffirming his promise to forgo a presidential paycheck. Administrator Linda McMahon accepted the check for $100,000 at a White House press briefing Oct. 3, 2018. "We're going to establish a seven-month intensive training program called 'Emerging Leaders,'" McMahon said at the briefing. "It's an adaptation of that program for our veterans, helping them transition from military life into private sector if they desire to start their own jobs and their own companies and be entrepreneurs." The second quarter covers April through June 2018. The White House press office did not get back to us on where Trump will donate his third and fourth quarter salary for 2018. Trump's yearly salary is $400,000. Article II of the Constitution requires the president to be paid, so Trump modified his promise to accept just $1 per year. Trump has donated his quarterly salary since taking office. Other recipients include the National Park Service, the U.S. Education Department, the Transportation Department, the Department of Health and Human Services, and the Department of Veterans Affairs. The choice of sending money to the Small Business Administration came despite Trump suggesting cuts to the agency in his 2019 budget proposal released Feb. 12, 2018. The document sought to cut 25 percent of the SBA's federal funding, reducing the agency's budget by 5.9 percent, according to the Washington Post. The Post reported that the SBA planned to use unspent funding from years past and new fees to make up the difference. Trump similarly proposed cuts to agencies for 2018 in favor of defense spending, but Congress did not act on those recommendations, according to The Post. We will keep tabs on whether Trump continues to donate his salary, but for now he's been doing just that. So we rate this Promise Kept. Correction: The story incorrectly referred to the Small Business Administration and has been corrected. 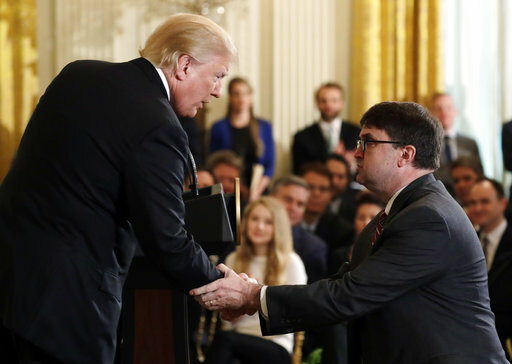 By Amy Sherman on Friday, May 18th, 2018 at 12:41 p.m.
President Donald Trump continued acting on his campaign promise to take no salary by donating his presidential paycheck to the Veterans Administration in May. Trump spokeswoman Sarah Huckabee Sanders announced Trump's latest donation of his quarterly salary in a briefing with reporters May 17. "In keeping with his campaign pledge, the president donates his salary on a quarterly basis to further important projects. Today, the president is proud to donate his 2018 first-quarter salary to the Department of Veterans Affairs to support their caregiver programs," she said. Trump has donated his quarterly salary to various federal departments and projects including to the National Parks Service to restore battlefields, the Department of Education for children's camps and the Department of Health and Human Services for a public awareness campaign about the dangers of opioid addiction and the Department of Transportation for infrastructure projects. During the campaign, Trump repeatedly promised to forgo the $400,000 paycheck. "As far as salary is concerned, I won't take even one dollar," Trump said in a Q&A Twitter session in September 2015. "I am totally giving up my salary if I become president." We will keep watching to see if Trump continues to donate his salary, but for now we rate this In the Works. By John Kruzel on Wednesday, July 26th, 2017 at 4:37 p.m.
For the second quarter in a row, President Donald Trump declined to take a salary and opted instead to gift the quarterly installment to a government entity, this time to the Department of Education. 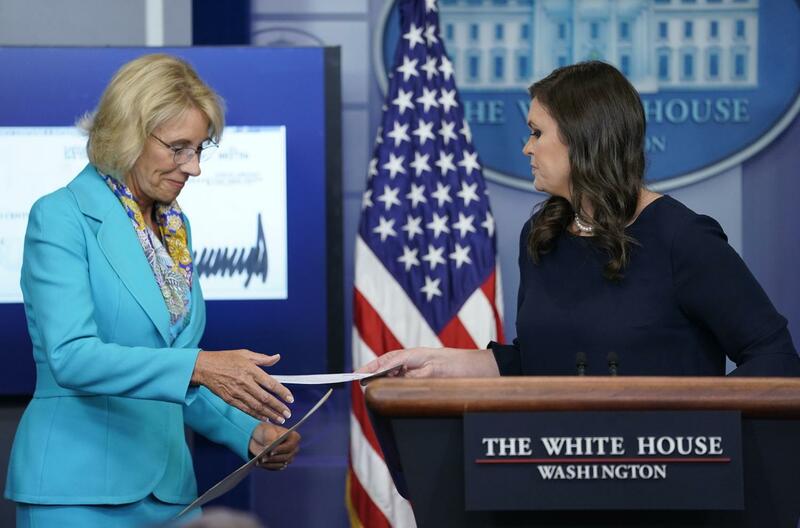 At a White House press briefing, press secretary Sarah Huckabee Sanders presented a check for $100,000 to Education Secretary Betsy DeVos. DeVos said the funding would go toward hosting a camp for science, technology, engineering and mathematics (STEM) students at the Department of Education. "We want to encourage as many children as possible to explore STEM fields in the hope that many develop a passion for these fields," DeVos said. Trump donated his first quarter salary of about $78,000 to the National Park Service. Sanders said the first quarter funds went toward restoring two projects at a national battlefield. She added that additional donations brought the total first quarter gift to over $260,000. Trump's donations are consistent with the billionaire businessman's campaign pledge to forgo a salary if elected. Until the policy becomes a permanent fixture of Trump's presidency, we're rating Trump's promise In the Works. By Louis Jacobson on Monday, April 3rd, 2017 at 5:30 p.m.
President Donald Trump has found a recipient for his presidential salary -- at least the portion he earned between January 20 and March 31, 2017. 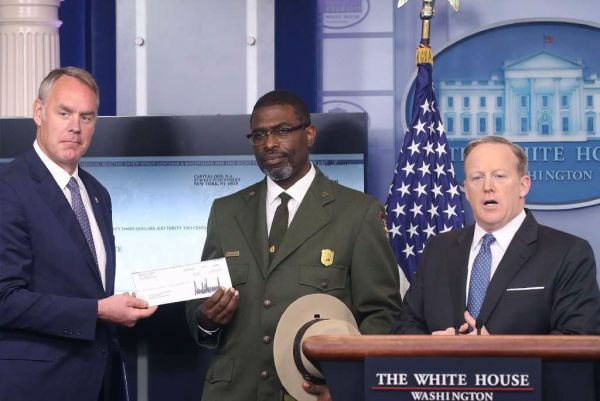 At the White House press briefing on April 3, press secretary Sean Spicer announced that Trump would be donating his full first-quarter, pre-tax earnings of $78,333 to the National Park Service. "The President has spoken with counsel and made the decision to donate his first-quarter salary, in total, to a government entity, and he has chosen this quarter to donate it to the National Park Service," Spicer said. Interior Secretary Ryan Zinke was at the podium to accept a check for that amount. "I am thrilled at the President's decision to donate the check he did today," Zinke said. He said the agency will use it to support "the infrastructure on our nation's battlefields. We're about $100 (million) or $229 million behind in deferred maintenance on our battlefields alone, and that's on our 25 national battlefields. And we're excited about that opportunity." This gesture is consistent with the pledge the billionaire businessman made during the campaign -- that "if I'm elected president, I'm accepting no salary." However, we are not yet rating this a Promise Kept until it becomes clear that this is going to become a permanent policy while he's in office. For now, we rate the promise In the Works. By on Friday, February 24th, 2017 at 6:50 p.m. The government owes Donald Trump. Right about now, the 45th president is due to receive his first paycheck, part of a $400,000 annual salary delivered in monthly installments. But the billionaire said during the campaign that he wouldn't take the pay. Is he backsliding on a promise? The White House says no, but things are more complicated. "He is required to get a paycheck but will be giving it back to (the) treasury or donating," spokeswoman Sarah Huckabee Sanders said in email, adding that the staff was trying to determine the legal process to do so. She declined to answer several inquiries into whether Trump has gotten a paycheck already, which would be about $33,333. In addition to the $400,000, a president is afforded a $50,000 expense account. "I won't take even one dollar," Trump declared in September 2015. "I am totally giving up my salary if I become president." "The President shall, at stated times, receive for his services, a compensation, which shall neither be increased nor diminished during the period for which he shall have been elected, and he shall not receive within that period any other emolument from the United States, or any of them." So Trump tweaked his promise. He now says he'll accept $1 — and it has added to his populist appeal. Trump supporters say the move deserves more attention especially now as his travel costs have dominated headlines. Trump's visits to his Palm Beach estate, Mar-a-Lago, have cost taxpayers an estimated $10 million already. Trump wouldn't be the first president to give away his pay. John F. Kennedy, also a wealthy man when he took office, donated his to charity. Herbert Hoover, also rich, gave his away as well. Florida Gov. Rick Scott, a multimillionaire, eschewed the $130,000 salary. In a way, Trump is like George Washington. The nation's first president said he would not take pay for the job, just as he had as commander of the Continental Army. "When I was first honored with a call into the service of my country, then on the eve of an arduous struggle for its liberties, the light in which I contemplated my duty required that I should renounce every pecuniary compensation," Washington said in his inaugural address of 1789. "From this resolution I have in no instance departed." But Congress pointed to a higher power: the Constitution. We'll be monitoring what happens with Trump's efforts not to take a salary. For now, we rate this promise In the Works. By Allison Graves on Friday, January 20th, 2017 at 11:00 a.m. The president of the United States stands to make $400,000 every year, but Donald Trump wants none of it. Trump reiterated this pledge as president-elect more than a year later on Nov. 13, 2016, when he told 60 Minutes' Lesley Stahl he still wouldn't take the salary. "I think I have to by law take $1, so I'll take $1 a year," Trump said. "But it's a ― I don't even know what it is. Do you know what the salary is?" "$400,000 you're giving up," Stahl said. "No, I'm not gonna take the salary," Trump responded. "I'm not taking it." Trump's pledge is similar to the precedent set by John F. Kennedy and Herbert Hoover, who donated their presidential salaries to charitable causes. Both men were wealthy prior to their presidency. Discussions about the president's salary trace back as far as 1789. According to congressional records, George Washington initially declined his $25,000 salary, but Congress refused to comply. Congress didn't do this for the president's benefit, but did so to encourage financial independence and prevent the president from being bribed by outside incentives. Trump has a few options if he chooses to decline his salary. He could donate his salary like past presidents or he could give his salary back to the U.S. Department of Treasury, said Michael McConnell, the director of Constitutional Law Center at Stanford University. Whether he could flat-out reject his salary or just take $1 is a complicated question. Article II, Sec. 1, Clause 7 of the Constitution prescribes a president be paid compensation "which shall neither be increased nor diminished during the period for which he shall have been elected, and he shall not receive within that period any other emolument from the United States, or any of them." As of September 2016, Forbes estimated Trump's worth at about $3.7 billion, meaning Trump could definitely afford to forgo his salary. The only other problem that could come up is if Trump tries to flat-out reject the salary. There has been no precedent for this, so experts are uncertain whether he is legally obligated to take his salary.